This book has wanted my attention for the longest time and I have ignored it for the longest time, till February 2015 set in and somehow this book came back to me and I knew I had to read it. “The Accidental Tourist” by Anne Tyler is a book that is not a fast read. It will not have you turn the pages at a neck-breaking speed. It will not do that and if you expect that from a book, then you should not read it. “The Accidental Tourist” is a book that should be read slowly, daily even, and in right doses. To me, that was the only way to read this book. A couple’s marriage is lost in the wake of their 12-year-old’s senseless murder. Macon Leary is now lonely. He is a man who believes in the ordinary and the structure that he has built around his life. He is a writer of travel guides and does not do well with changes. Sarah Leary cannot cope with the loss of their son. She walks out on Macon. Macon is left to pick up the pieces and then he meets Muriel, who sets his orderly life spinning. “The Accidental Tourist” is a book that will make you go out and hug people. It is the kind of book of new beginnings, lost and forgotten relationships and what it does to human beings. 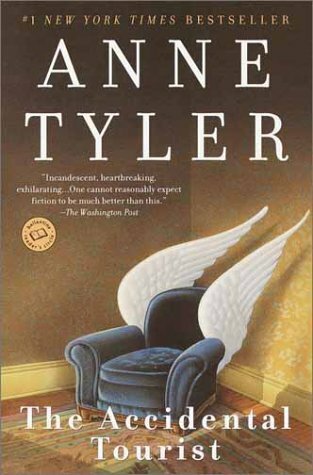 Anne Tyler is a master of writing about relationships and the modern frameworks they are bound by. She avoids the melodrama and eases the reader into the story. “The Accidental Tourist” is a book which you must savour and read and think about after. This entry was posted in Anne Tyler, Authors I Love, Ballantine Books, Books, Literary Fiction, random house, Review and tagged Anne Tyler, Ballantine Books, Divorce, family, literary fiction, relationships, Review, The Accidental Tourist on February 26, 2015 by thehungryreader.